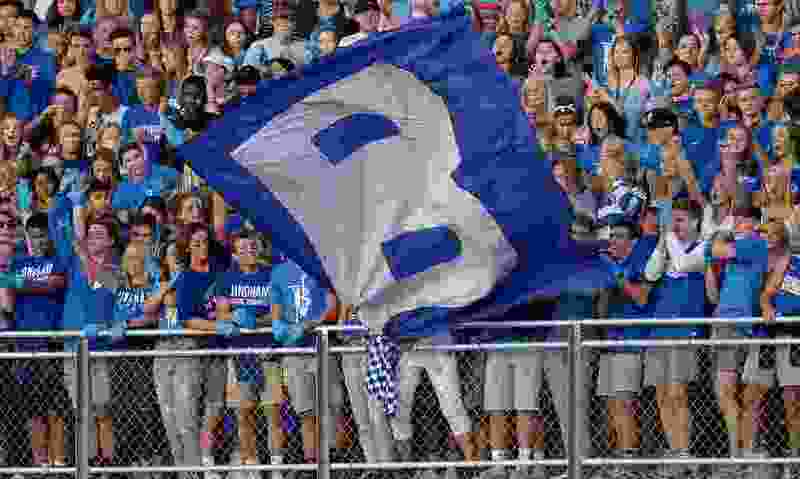 (Francisco Kjolseth | The Salt Lake Tribune) The Bingham High student section cheers on their team as they rack up touchdown after touchdown against East High at East on Friday, Aug. 24, 2018. A Utah high school became the first in the state to implement a piece of technology giving fans a chance to follow its sports teams in real time, no matter their location. Bingham High School in November installed a device called Scorebird that plugs in to the scorekeeping mechanism in its basketball gym and pushes every piece of information from the scoreboard to Scorebird’s system. Through VNN, a sports media service utilized by more than 70 Utah high schools, those live scores appear on Bingham’s website. Bingham athletic director Andrea Bouwhuis said the new system was implemented just before the start of basketball season and displays scores from sophomore, junior varsity and varsity games. So far, Bouwhuis has seen only positives come from the implementation of Scorebird. The coaches and community “love it," she said. It has been especially helpful for alumni of the school who are out of state and want to follow the teams’ progress, Bouwhuis added. Bingham will attempt to use Scorebird during baseball season, which starts this week, Bouwhuis said, as well as for softball and soccer. There are also plans to use it during football season next year. While the technology currently only has the capability of reproducing what is shown on a scoreboard, Scorebird president Ian Woodward-Smith said the company is looking at ways to add play-by-play and brief, automatically generated postgame narratives in the coming years. VNN approached Bingham to try Scorebird because of the school’s success in various high school sports over the years and because the athletic department likes to be on the cutting edge of new technology, said Romy Glazer, marketing director for VNN. The “little tiny box,” as Bouwhuis describes it, was free to the school in an effort to get feedback from Bingham. Next year, Bouwhuis said, the school will purchase three boxes — one for each venue where sports are held (soccer stadium, baseball/softball complex and gymnasium). Glazer said the Scorebird boxes cost $350 each. Bouwhuis said the cost of the boxes pale in comparison to the return on investment. With the Scorebird technology having such a positive impact on the Bingham, Bouwhuis hopes others in Utah will follow. “I think other school communities would really like it,” Bouwhuis said.